Coreos ballades: Alamo Boom, Amame Un Poquito, DHSS, Ding Ding, Imelda's Way, Lindi Shuffle, Mamma Maria, P3, Precious Times, Rita's Waltz, The Cucaracha, The Little Rhumba, Give Me Love. Ballats: 101, Amame Un Poquito, Baby Blues, Baby Bubbles, Blue Night Cha, Coastin', Country Walkin', County Line Cha Cha, DHSS, Ding Ding, Imelda's Way, Jamaican Run, Mamma Maria, My Maria, P3, Rita's Waltz, Shakin' Mix, Stroll Along Cha Cha, The Boss, The Cucaracha, The Little Rhumba, Two By Two, Whole Again, Irish Stew, Showed Up Late, Give Me Love. Ensenyats: Completely, Speak To The Sky. Ballats: Better Times, Blue Night Cha, Ding Ding, Fly High, Give Me Love, In My Heart, Muntsa, One Thing, The Mona Lisa, This Is Me, Rolling In The Deep, Half Past Nothing. Ensenyats: Little Bit of Everything, A Little Biy Gypsy..
Coreos ballades: Alamo Boom, County Line Cha Cha, DHSS, Imelda's Way, P3, Rita's Waltz, Sweet Maureen. Ensenyades: Baby Bubbles, Coastin', Showed Up Late, Stroll Along Cha Cha i Shakin Mix. Ballats: 101, Amame Un Poquito, Baby Blues, Baby Bubbles, Blue Night Cha, Bosa Nova, Coastin', County Line Cha Cha, Cut A Rug, Cheek To Cheek, Chirpy Charleston, Down On The Corner, Live Laugh Love, P3, Quando When Quando, Rita's Waltz, Stop Cryin', Sweet Maureen, The Boss, The Cucaracha, This & That, Toes, Two Boys, Whole Again. Ballats: Fly High, Give Me Love, High Cotton, No Man's Land, One Thing, The Shoebox, Voodoo Jive, Whiskey Instead Of Wine. Ensenyats: The Mona Lisa, Little Bit of Everything, A Little Biy Gypsy..
1929, 1000 Years, 50 Ways, Amame, Baby Blues, Baby Bubbles, Better Off, Bruises, Caballero, Caught In The Act, Clap Happy, Clikety Clack, Come Dance With Me, Country As Can Be, Cowboy Boogie, Chill Factor, Chirpy Charleston, DHSS, Dissapearing Taillights, Eatin' Right, Fly High, Go Cat Go, Gotta Keep Prayin', Human Dancer, In My Heart, Is It Friday Yet, Islands In The Stream, Jamaican Run, Kiss Me Mary, Knee Deep, Less Travelled, Live Laugh Love, Lips So Close, Make This Day, Mamma Maria, Muntsa, My Dear Juliet, One Thing, P3, Precious Time, Quando When Quando, Rose Garden, Sacred Trust, San Lucas, Something In The Water, Speak To The Sky, Sticht It Up, Stop Crying, Summer Fly, The Boss, The Cucaracha, The Flute, The Mona Lisa, The Piper, Two By Two, Vertical Expression, Whole Again, Give Me Love, Little Bit Of Everything, A Little Bit Gypsy, Sexi Mi Mi i Raggle Taggle Gypsy O.
Recobrats del festival tornem a les classes. Debutants i improvers a Campllong 16/05/2014. Introduits 2 balls dels workshops: Showed Up Late i Give Me Love. Repassats 2 clàssics: 1000 Years i Mucara Walk. Repassat el The Boss, Shakin' Mix i Open Book. Ballats Amame un poquito, Coastin', Imelda's Way, Jamaican run, Live laugh love, P3, Precious Time, Quando When Quando, Rita's Waltz, The Cucaracha, The little rhumba, Toes, Two by two, Whole again i Irish Stew. Classe intermedis dissabte Campllong 17/05/2014. Ball nous: Give Me Love. Repàs: In my heart, One Thing, The Boss, The Mona Lisa. Ballats: Imelda's Way, High Cotton, Fly High, Cheek to Cheek i Dissapearing Taillights. Palafrugell. Classe Improvers/Intermedis dimarts 20/05/2014. Balls nous: Give me love, Fly High. Repassos: Bridges to my heart, Make this day, The Boss. Ballats: Blue night cha, Caballero, Cadillacs and caviars, Ding ding, Is it friday yet, Open book, P3, Speak to the sky, Stitch it up, Stroll along cha cha, We are the same, White rose, Whole again, Cut the rug. Classe intermedis dissabte Campllong 24/05/2014. Aquesta setmana hem repassat la coreo Sweet Maureen (Rafel Corbí) i el clàssic County Line Cha Cha (Desconegut). A més, hem introduït el Cut The Rug (Jo & Rita Thompson). També s'han ballat Amame Un Poquito, Country As Can Be, Country Walkin', The Funky Matador, Honey Pie, Mamma Maria, My Pretty Belinda, P3, Precious Time, Simply Mambo, The Cucaracha, The Little Rhumba, This & That, Two Boys, Cowboy Strut, Where I Belong, Cumbia Semana, Rita's Waltz i el Crazy Postman. A la classe del 26 de març (dimecres) vam repassar per petició els balls Bobbi With An I (Rachel McEnaney) i el Bobbie Sue (Daugherty & Hand). Vam ballar el Bruises, Chirpy Charleston, Muntsa, My Dear Juliet, Open Book, Quando When Quando, Summer Fly, The Shoe Box, The Wanderer, Wanna Be, We Are The Same i What About Now. Es fa fer el segon repàs del ball Make This Day (Rachael McEnaney) i vam indroduir per primera setmana el High Cotton (Niels Poulsen). Vam començar la classe fent un repàs del ball Baby Blues (Tina Argyle) i del Badda Boom Badda Bang (Karen Hunn). Per segona setmana vam repassar els clàssics Chirpy Charleston (Gaye Teather) i el Bossa Nova (Phil Denington). També vam fer un petit repàs per petició del ball Darling Mountain (Rafel Corbí) i del Whole Again (Sue Johnstone). Es van ballar el Amame Un Poquito, Baby Bubbles, Blue Spanish Eyes, Coastin', Country Walkin', County Line Cha Cha, DHSS, Ding Ding, Down On The Corner, Last Night's Dance, Live Laugh Love, Precious Time, Quando When Quando, Stroll Along Cha Cha, Sweet Maureen, The Cucaracha i The Little Rhumba, This & That i Toes. Classe canyera la del dissabte amb la presentació dels balls One Thing (Rafel Corbí) i In My Heart (Maggie Gallagher). Repàs del High Cotton (Niels Poulsen) i el Fly High (Maggie Gallagher). Ballats Better Times, Chirpy Charleston, My Dear Juliet i The Shoe Box. Al ball social vam ensenyar el ball Once Thing (Rafel Corbí) i vam repassar el Make This Day (Rachael McEnaney). Es van ballar (en ordre alfabètic) balls que feia dos mesos almenys que no sonaven, com Sunshine, Rio, 1000 Years, My new Life, County Line Cha Cha, Is It Friday Yet, Chirpy Charleston, Country Walkin', In My Heart, Honky Tonk Swing, Better Off, I'm No Good, Pot of Gold, Vertical Expression i Bobbi With An I. A més d'aquests, els més habituals 50 Ways, Amame, Baby Blues, Better Times, Blue Night Cha, Blurred Lines, Bossa Nova, Bruises, California Blue, Coastin', Cheek To Cheek, Chill Factor, DHSS, Ding Ding, Down On The Corner, Fly High, Galway Girls, Imelda's Way, Islands In The Stream, Kiss Me Mary, Less Travelled, Lips So Close, Magic Moon, Mamma Maria, Mexi-Fest, Move A Like, Muntsa, My Dear Juliet, No Man's Land, On The Rocks, P3, Quando When Quando, Rhyme Or Reason, Shame & Scandal, Something In The Water, Stop Cryin', Stroll Along Cha Cha, Summer Fly, Sweet Maureen, The Flute, The Piper, This & That, This Is Me, Two By Two, Voodoo Jive, Wagon Wheel Rock, Whiskey's Gone i Whole Again. Aquestes dues setmanes (10 i 17 de març) ens hem centrat en la coreo Sweet Maureen (Rafel Corbí) i el clàssic County Line Cha Cha (Desconegut). També s'han ballat Amame Un Poquito, Cowboy Boogie, Cowboy Charleston, DHSS, The Funky Matador, Last Night's Dance, Mamma Maria, P3, Precious Time, Sunshine, The Cucaracha, This & That, Two Boys, Cowboy Strut, Basic Waltz, Where I Belong, Cumbia Semana i Rita's Waltz. A la classe de l'11 de març vam ballar el Chill Factor, Live Laugh Love, P3, Rose Garden, Speak With Your Heart, This Is Me, We Are The Same, Whole Again, My New Life i La Chico. Vam fer repassos extens de Muntsa (David Villellas), Ding Ding (Rutherford), Chirpy Charleston (Gaye Teather), Summer Fly (Geoffrey Rothwell), The Wanderer (Michelle Risley) i The Piper (Hazel Pace). A la classe del 18 de març, vam començar per petició amb un repàs del Chill factor (Whittaker & Westhead), vam repassar el Muntsa, el Chirphy Charleston, el Summer Fly, i vam introduir el Make This Day (Rachael McEnaney). A més, es van ballar Caballero, My Maria, Ding Ding, Islands In The Stream, Whole Again, We Are The Same, The Showbox, The Wanderer, Stroll Along Cha Cha, Teplepathy, Caught In The Act, Cheek to Cheek i Blue Night Cha. Vam començar la classe introdiunt dos clàssics de debutants: County Line Cha Cha (desconegut) i Cut A Rug (Jo & Rita Thompson). Els dos clàssics que vam recuperar en aquesta classe van ser el Chirpy Charleston (Gaye Teather) i el Bosa Nova (Phil Denington). Repassos de Sweet Maureen (Rafel Coprbí), Coastin' (Ray & Tina Yeoman), Baby Bubbles (Gaye Teayher) i Blue Spanish Eyes (Juliet Lam). Es van ballar el 101, Amame Un Poquito, Cheek To Cheek, DHSS, Ding Ding, Live Laugh Love, P3, Rhumba & Roses, Rita's Waltz, This & That, Toes, Two Boys, The Cucaracha i Cumbia Semana. Intensa classe del dissabte amb la presentació del ball High Cotton (Niels Poulsen). Repassos de Speak To Your Heart (Metelnick), Chirpy Charleston (Gaye Teather), We Are The Same (Amato's) i Fly High (Maggie Gallagher). Ballats This is Me, Bruises, Wagon Wheel Rock, Move A Like, No Man's Land i Voodoo Jive. Al ball social vam ensenyar el ball Make My Day (Rachael McEnaney). Es van ballar (en ordre alfabètic) 1929, 50 ways, Amame, Baby Blues, Better Times, Blue Night Cha, Blue Spanish Eyes, Blurred Lines, Bosa Nova, Caballero, Cheel To Cheek, Chill Factor, Ding Ding, Evergreen, Fly High, Galway Girls, Human Dancer, Imelda's Way, Jamaican Run, Just a Kiss, Knee Deep, Live Laugh Love, Mexi-Fest, Muntsa, My dear Juliet, My maria, No Man's Land, On The Rocks, P3, Precious Time, Quando When Quando, Rhyme Or Reason, Rose Garde, Shame & Scandal, Something In The Water, Stroll Along Cha Cha, Summer Fly, Sunday Driver, Tennessee Waltz Surprise, The Little Rhumba, The Shoebox, This & That, This Is Me, Toes, Voodoo Jive, Wagon Wheel Rock, White Rose, Whole Again, Slapping Leather, California Blue, Speak With Your Heart, Now or Never, Caught In The Act, Take A Breather, Less Travelled, High Cotton i The River. 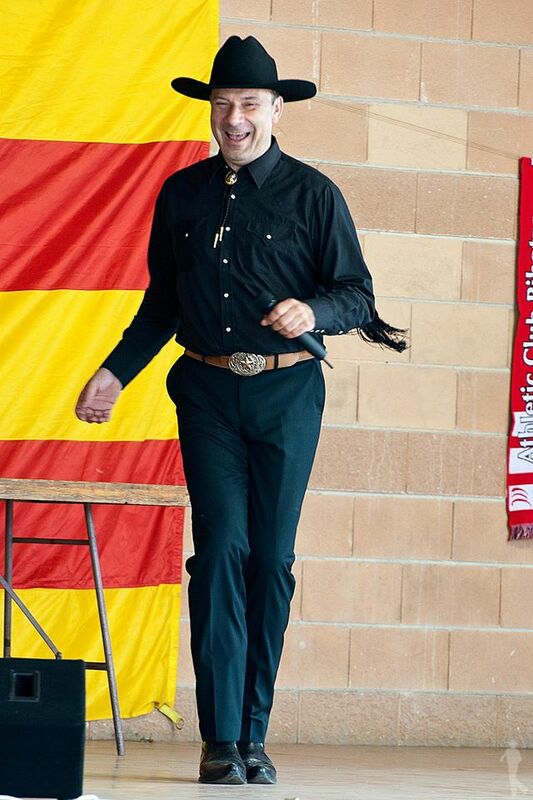 Amb la classe de debutants del dilluns hem començat a treballar amb el ball "Sweet Maureen" (Rafel Corbí), introduint també el clàssic "Cowboy Strut". La resta de balls inclouen Amame Un Poquito, Country Walkin', Last Night's Dance, Mamma Maria, My Pretty Belinda, P3, The Cucaracha, The Little Rhumba i This & That. Repàs (2a) al Coastin' (Yeoman), Blue Spanish Eyes (Juliet Lam), Whole Again (Sue Johnstone) i el Ding Ding (Rutter & Butterworth). També hem ballat els Sweet Maureen, Mamma Maria, Sunshine, Cumbia Semana, The Cucaracha, Cowboy Boogie, Toers, This & That, The Little Rhumba, Rita's Waltz, Quando When Quando, Precious Time, P3, My Pretty Belinda, My Maria, Last Night's Dance, Cheek to Cheek, Country Walkin', Blue Night Cha i Amame Un Poquito. Amb els alumnes d'intermedi del dissabte hem repassat per petició el Lips So Close (Rafel Corbí), el This Is Me (Yvonne Anderson) i el We Are The Same (Amato, Robinson & Thompson). També hem fet la 3a setmana del Fly High (Maggie Gallagher). Altres coreos ballades han estat If I Was A Single Man, Muntsa, No Man's Land, Voodoo Jive, Whiskey Instead Of Wine, Ding Ding, Life Is A Highway i Bruises. En aquesta classe hem fet un repàs de balls clàssics que fa temps que no ballàvem. El Wanna Be de Dan & Jan Pye (Improver, 32 temps, ritme mixte); el We Are The Same, de Barry & Dari Anne Amato, John H. Robinson & Jo Thompson; i el Speak With Your Heart, de Peter Metelnick i Alison Biggs.